The following is a guest post by Chelsey of TheBakeSite.com, who has graciously offered to step in with this post while I’m enjoying some much-needed family time. I hope you enjoy her tips on baking with kids, and getting kids in the kitchen! Hey, all! My name is Chelsey. I’m a baker, a blogger, and a mom of 3 beautiful little girls. My twins just turned 1 at the beginning of November and my oldest is 3. Although it isn’t always easy, I absolutely love to bring my kids into the kitchen with me! I’ve been baking since I was a child, I’ve only been parenting for 3 years, and what I’ve learned from combining the two is that baking with a toddler is a whole different art. A tooth-gritting, tongue-biting, “that stain might come out” kind of art. But it’s also about inspiring confidence, encouraging creativity, and unwinding with our family. The kitchen can be an intimidating place, not to mention a little dangerous. I’d love to share with you some of the ways I’ve learned to incorporate the abilities of a toddler into my baking world! I’m really excited to be guest posting over here on The Big To Do List – I think Hannah is wonderful and I’m thrilled to have the opportunity to reach all of her lovely followers! So, I’ll just briefly explain what my deal is here on the internet. I publish a baking blog at TheBakeSite.com and I also sell gourmet baking mixes, both at my site and at my Etsy shop, Bake Homemade. I have such a passion for baking, I love to share my projects with as many people as I can. But I’m also passionate about inspiring other people to create. And that’s the premise behind my blog and my products – I want to give everybody the chance to create something delicious that they can enjoy and feel proud of. 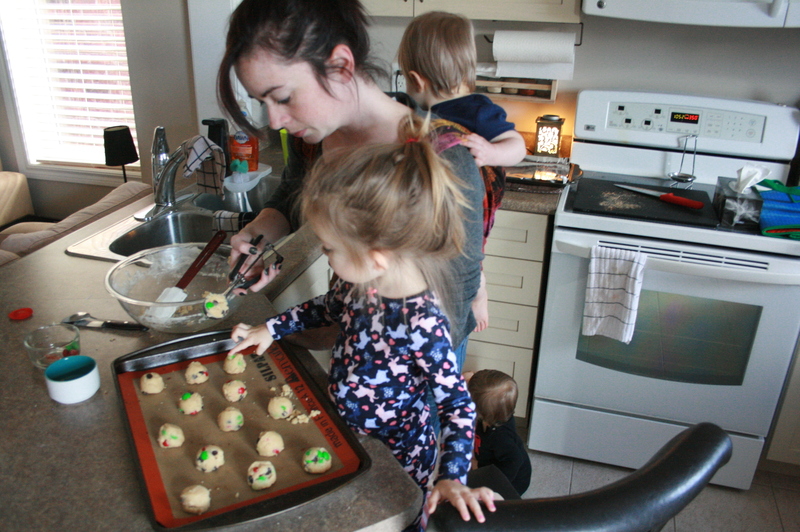 In this post, my daughter and I are baking up Santa’s favourite cookies, just in time for the holiday season! Of course, I think my baking mixes are the perfect way to get kids growing their creative skills, but the tips and pointers I’ll be sharing here can be applied in any culinary venture! These cookies require 3 simple ingredients in addition to the baking mix – ½ cup of softened butter, 1 egg and a teaspoon of vanilla. So you don’t have to go buy a whole bag of flour that you’ll push around in your pantry for a year while it grows old and stale, or spend your time weighing your dry ingredients to the exact gram the recipe calls for. I’ve taken care of it, so when you’re baking with kids, you just get to do the fun part! To start, we remove some of the chocolate chips and M&Ms from the jar and set them aside. This is an easy step to hand over to a child of any age. It doesn’t need to be perfect, some sugar in the mix-ins and some mix-ins in the sugar are both totally fine and won’t affect the final cookie. Next, stir up the softened butter a bit and then mix in the egg and vanilla. It’ll seem a bit lumpy and weird, but it’s not a problem. Just hand over the spatula or wooden spoon and let the kids get to work! Learning to crack an egg is a great skill to get the kids working on. Especially for the little ones, it’s funny how much confidence and pride can come out of the simple whack of an egg. Also, I can almost guarantee there will be eggshell in the places you don’t want eggshell. For this reason, have them crack it into a separate bowl or ramekin and you can pick out the shell before stirring it into your other ingredients. (And, another tip, wet your finger with a bit of water to make shell-removal much easier!) Show them how to hold the egg – even with two hands if need be – and help them gently crack and separate the shell. At this point, I like to get my hands in the cookie dough. Sometimes it can just use a bit of manual manipulation to bring it together into a smoother dough. Luckily, this is pretty much everything a child loves to do. It’s messy and squishy – they’ll be thrilled to be given permission to get their hands in that bowl! Now is also the time to pour in the chocolate chips and M&Ms we set aside earlier. I find it’s best to refrigerate this dough for about 30 minutes. Once the butter in the dough is nice and firm, scoop it into rounded tablespoon-sized balls and place them on a cookie sheet. Let your little helper grab a small spoon and do some scooping too, but be sure to fix any crumbly lumpy bits before baking. Bake at 350*F for about 10 minutes. Take them out of the oven while the center still looks quite pale. No matter how young or how old, getting into the kitchen and really making something is a powerful thing. Plus, it’s fun! So loosen up, unwind a little and get your hands messy. Then clean them and eat some cookies, because whoa. They’re soft and chewy and chocolatey and so, so good. Thank you for having me here at The Big To Do List. It’s been fun rambling to you all about baking with kids! Enjoy! Thanks so much for having me as a guest here, Hannah! Hope you’ve enjoyed some relaxing family time – nothing is more important! No, thank YOU, Chelsey! We had such a great time, and I agree – so important!